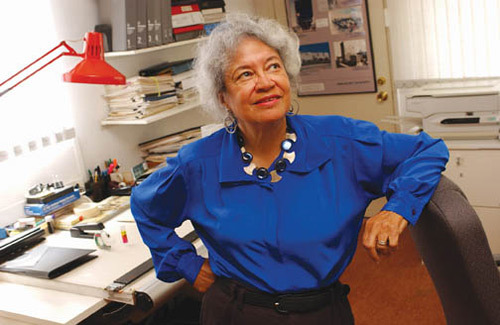 Norma Merrick Sklarek, the first African American woman to become a licensed architect in the country, died on Monday in Los Angeles, The Los Angeles Times reports. Sklarek, a native of Harlem, went to Barnard College before graduating from Columbia’s architecture school in 1950. She passed the New York State exam in 1954, becoming the first African American woman to receive her professional architecture license and earning her the nickname “the Rosa Parks of Architecture.” She later moved to California where she was turned down for work 19 times before going on to work for SOM, Gruen Associates, Welton Becket, and the Jerde Partnership. Sklarek’s more notable projects include overseeing staff at Gruen for the construction of the U.S. Embassy in Tokyo and acting as project director at Welton Becket for LAX Terminal 1. Before joining Jerde in 1989, she co-founded one of the largest all-women architectural firms in the country, Siegel-Sklarek-Diamond. She would go on to become the first African-American woman inducted as a fellow at the AIA. Mabel O. Wilson, an associate professor at Columbia’s GSAPP, recalled hearing Sklarek speak Howard University when Wilson was still a student. It was the first time she had seen an architect who was an African American woman. “I wasn’t seeing a reflection of myself in the field, and then there she was,” said Wilson. She added that Sklarek’s hard work and staying power aligns nicely with the ethos of the profession. “It still takes a lot of tenacity to land where she did and do the work she did at LAX–and that doesn’t matter who you are,” she said. The Architect’s Newspaper sends our condolences to Sklarek’s family, friends, and colleagues.